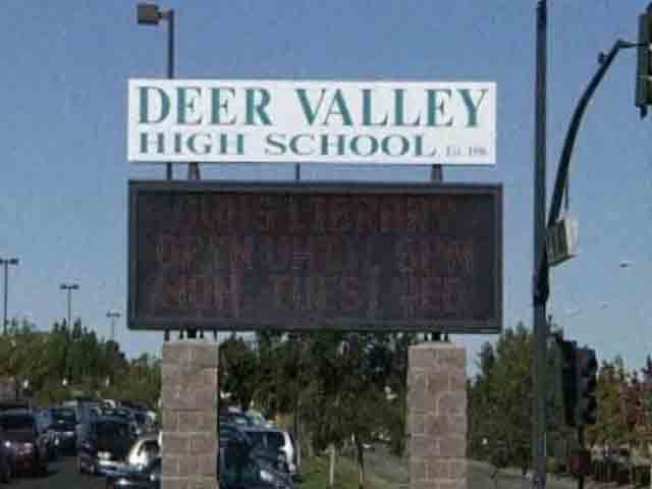 A 17-year-old boy killed in a car crash in Antioch has been identified as a Deer Valley High School senior. Grief counselors were on hand Monday at Antioch's Deer Valley High School after a "well-liked" senior at the school was killed in a car accident Friday, the school principal said. The coroner's office identified 17-year-old Lydell Benjamin as the teenager who died in a crash on Hillcrest Avenue and Sterling Hill Drive around 7:10 p.m.
Two vehicles were involved in the crash, according to police. Both were speeding before the accident in which one car crashed into a tree, ejecting Benjamin and a 19-year-old Antioch man. The two cars did not collide, according to police. Benjamin was pronounced dead at the scene, while the 19-year-old was taken to the hospital with serious injuries, police said. The driver of the second vehicle was an 18-year-old Antioch man, who came forward a day after the fatal crash. He is now cooperating with authorities, according to police. Principal Kenneth Gardner said word about the senior's death spread quickly Friday night and counselors were called into the school Monday. The principal said Benjamin was "well-liked on campus" and "everybody enjoyed him."